Debutante & budget - Two words that you don't really want to associate together, but to plan a ball for over 600 people you need to watch your budget very carefully especially when your buying everything in the hundreds. My budget for the decoration, well, it was very small. Remembering this ball is in a small country town in Australia (held in the school gymnasium) and so that everyone can join in and be a part of the night the costs had to be controlled. I read recently about the wonderful Debutante ball in New York at the Waldorf-Astoria, and the tables costs $14,000 each. I can only imagine what the decorations were like. I'm sure they were stunning. I attended a few events like that when I was a Fashion Editor, they are amazing, but at the end of the day you can still create a wonderful room on a tiny budget and here are a few tips. My plan, what do I buy and what can I make? I needed to buy things like the artificial blossoms sticks, napkins, lights, stationary, bird cages and ribbons then the rest I thought I will just have to make. 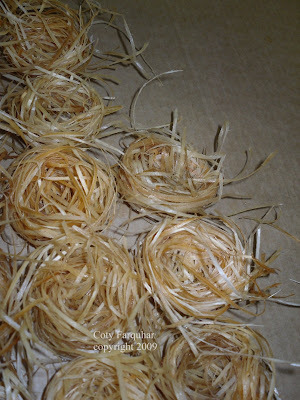 Little birds nests: Each little nest was hand made for each guest and made from wood wool. What is wood wool? It is shredded wood, usually Pine and it is used in the packaging industry to protect fragile items like pots and antiques. It is used to stuff into wooden crates before shipping off to other countries. I love it! I use it for many things when I style, it is a great colour and very clean and it's great for flower displays... and best of all,it was all free. Most companies throw it away. You can do so many things with it, mould it, shape it, drape it from huge baskets and use it for displaying objects and more.. I'm totally HOOKED on wood wool, so I've added my post to HOOKED ON FRIDAYS party at Julia's fantastic blog Hooked on Houses. 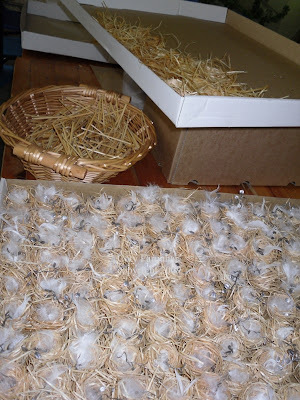 How to make the little nests: Firstly you need to soak the wood wool for a couple of hours as this makes it easier to work with. Grab a small hand full and start moulding it in your hands, thumb in the centre, twist away clockwise in your hand, it's a bit like turning spaghetti on you fork. 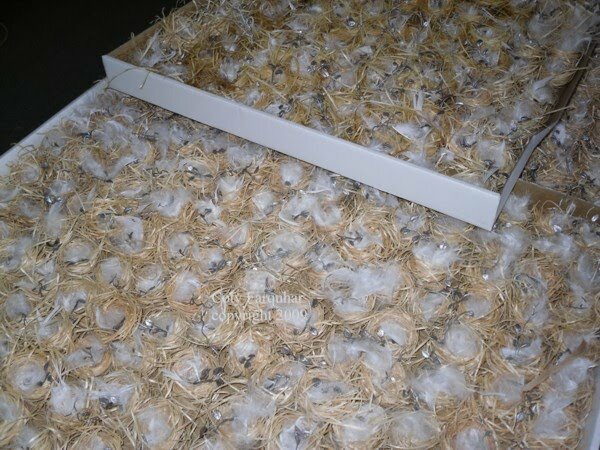 Then place each birds nest closely together on a tray so they all hold their shape. 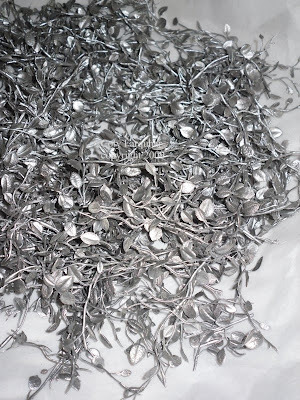 They will need a couple of days to dry and when there dry add one little feather and a sprig of what ever you like, I used a tiny little silver leaf cut from some of my left over Christmas garlands. Then add a little sugared egg or chocolate egg closer to the dinner date. And everyone took their little birds nests home at the end of the night, I also heard a story from a beautiful Grandmother on the night, she said she has a collection of sugared almonds from all the weddings she has been to. They are too beautiful to ever eat and they last forever. Welcome to all from Tablescape Thursday with Susan from Between Naps on the Porch, Visit Susan and her many other guest from around the world to see how everyone is entertaining this week. Labels: FLOWERS AND DISPLAY, WEDDINGS AND EVENTS. Oh my! I would have been seeing those in my dreams for weeks to come. They are wonderful, and add a soft touch to the table. How very beautiful it was! Those bird nests are adorable! I like the theme with the birdhouse, etc. I came back to see more of the ball! Those nests were a stroke of genius! I am filing this idea away --under "cheap great table decorations for a crowd" :) I love that the program matched! Did you have to buy the woodwool or were you able to find it free? I love these little nests!! How ingenious!! I am wondering where I can find the wood wool. Do you think they have it in the states?? What a great idea! 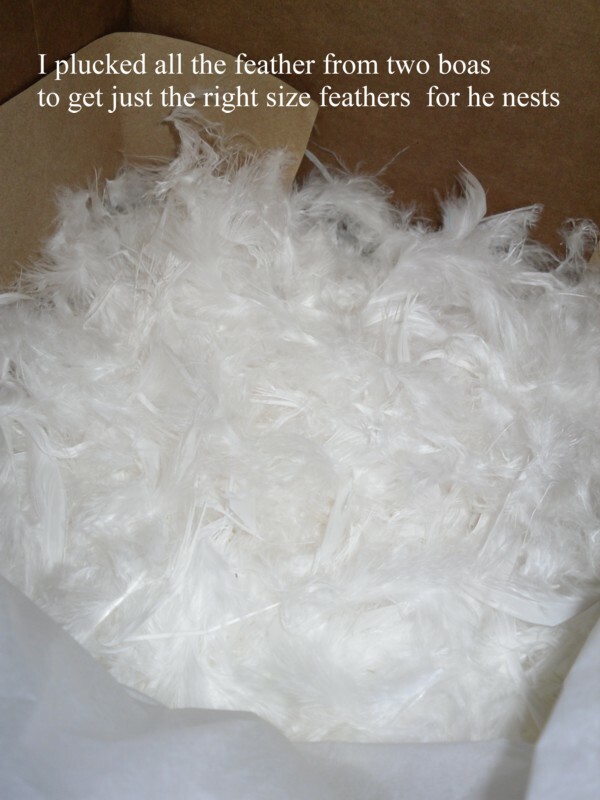 I was wondering how you got the "feathers" and when I read they were from a feather boa, I thought how ingenious! Love that you think a budget friendly wedding/ball can be just as nice as the high-end ones! What a great idea. How creative. I'd love to try that sometime with my Girl Scouts, but I have to put my hands on some wood wool (never had heard of it) first. it's so wonderful to know that you don't go 'over budget' like so many stylist do....it means so much more to everyone with a bit of ingenuity!! I love this post. It's great to get help from someone so experienced, and ideas that work and are beautiful. thank you! Those are absolutely precious! You are very ingenious and resourceful to use the packing material. Great idea. I'll bet your hands were sore after shaping so many. The tables turned out beautiful from all your efforts and how nice to be able to have the whole town attend. Have a wonderful day and try to relzx now that it is over. Those are so beautiful. They turned out amazing and so delicate looking. Beautiful job! You amaze and inspire me. These are lovely! I must remember this idea! Nothing is more lovely than a spring bird nest filled with a sweet pink egg! My heart is happy now...thanks for sharing! You do BULK very well! My oh my the nests are wonderful! A whole flock, and I'm thrilled that you had the time to show us how! Love the header for your garden blog. Looks like a magazine cover. Gee i wonder where you ever got that idea? Can hardly wait for Treasures & Fabulous Finds. These are so sweet. I love bird nests. Lovely. How creative! These are darling.